Did we need to be reminded that the Droid franchise is awesome? Probably not. 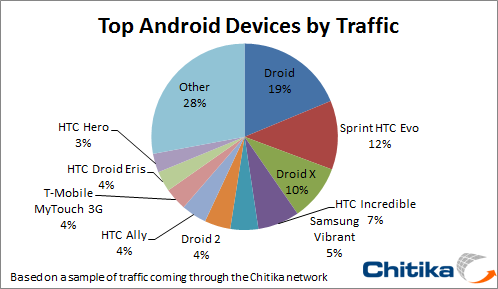 But if you did, just check out the chart above from Chitika who claims that our favorite lineup of phones makes up for 44% of Android traffic on their ad network with the original Droid still leading the charge. Talk about an impressive number there. 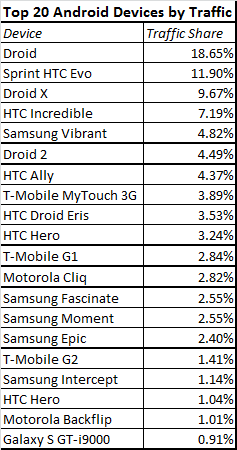 The number 2 device on their list was the HTC EVO, but after that it goes Droid X, Incredible, Vibrant and Droid 2. So of the top 6 devices, 4 of them are family members. Again, wow. Check out the full top 20 list after the break. Cheers to the marketing group behind the Droid brand!